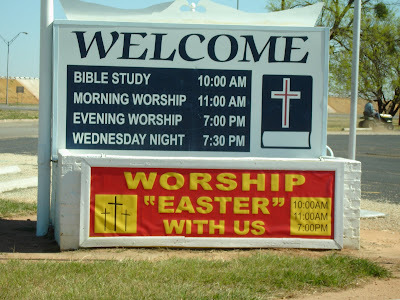 The “Blog” of “Unnecessary” Quotation Marks: "easter"
Maybe since they're worshiping "Easter" their acknowledging the holiday's pagan roots, and it's actually a service honoring Ēostre. Orthodox Easter is the week after, actually. Wait, no. You said it right. As opposed to "Bunny-Rabbit-and-Chocolate-Eggs Day"
I think Daniel's on to something. Maybe celebrating "Easter" is actually a cover for celebrating Beltane. "Zombie Jesus Day" sounds more accurate anyway. It's because secretly they refer to it the same way I do (I do it not so secretly though) as Chocolate Day. They'll rope 'em in for Easter and keep 'em by keeping the sermons short! ps. I was going to send this in, but I never got around to taking the picture. Sunday evening service is mainly a Protestant thing. As is calling it "worship." The Orthodox do Liturgy and on Sunday it's almost always in the morning. Catholics do Mass, frequently several, but rarely after 5:00 p.m. on Sundays. You don't get much faster than the 7:00 a.m. Mass that was over in 20 minutes. If they were Orthodox it would be "Pascha." I don't know if you can say that the quotation marks are unnecessary without actually understanding what the person is trying to get across. They are obviously showing 'Easter' as something other than the holiday. We don't 'worship' Easter, we Celebrate Easter. Maybe they'll explain at the service how Christ is Easter. Christ represented by his resurrection which is now know as Easter. Not that this is a proper use of quotations, but they don't sell highlighters that big. It's like having an underline on a web page. 'All underlines have to be hyperlinks.' It's really not that big of a deal. Let's face it, the only place quotation marks really matter is in the code, are you using single quotes or double quotes? kkevilus, I think if you have to work that hard for a writer to get their intention, they deserve a little good-natured ribbing. Everyone knows its official name is Jesus Zombie Day. I guess kkevilus has proved that there is no point to this website.